Here's another little idea for a romantic dinner for two. Rolls are not difficult in preparation — whether a beginner can easily cope with it. It will be nice to connect with rolls «Flower» on one dish — then admiring look of your mate is guaranteed. At once, there will be three in one: flower, and surprise, and food, created by loved one. Prepare rice for sushi: wash rice well in several waters, to stop changes of water color. Take for 1 gl of rice 1,2 gl of water. Bring rice to boil and cook for 15-17 min. Rice should absorb all water. Leave rice covered for for another 15 min. Next, slightly stir with rice vinegar (1 tbsp). 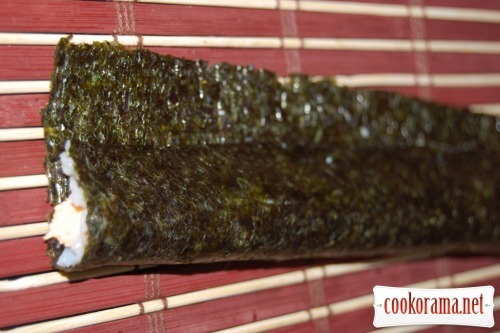 Divide a sheet of nori in 2 parts. 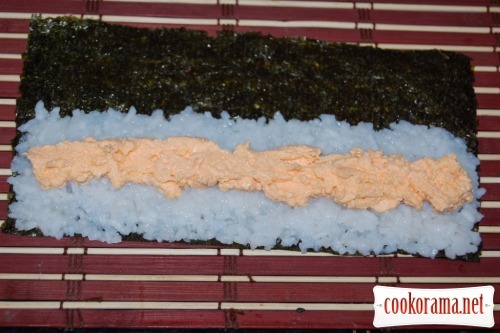 Spread nori smooth side down on bamboo mat. 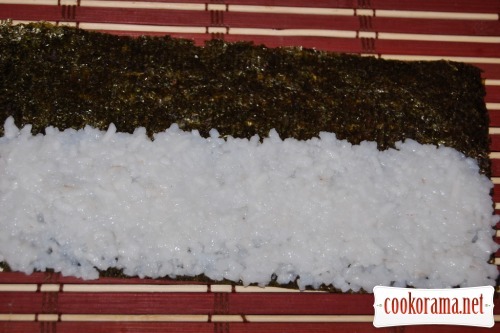 Put rice with wet hands on nori at 0,7 сm thick and 2/3 length of nori. 1/3 of sheet should be empty. 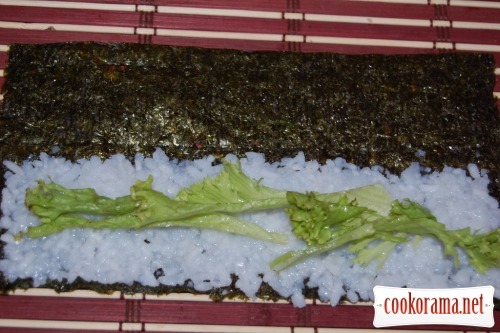 Put in the middle of rice strip of caviar. With the help of a bamboo mat combine nearest edge of nori with the place where rice ends. It turns out in shape of drop. 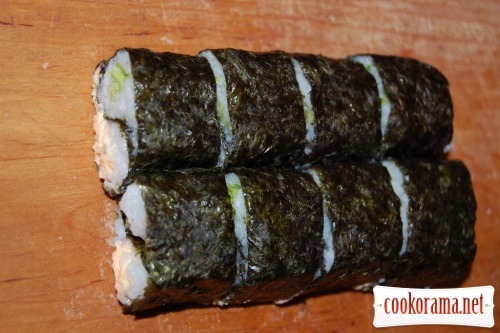 In the second part of the nori in the same way put rice and chopped lettuce. Fold also in «drop». There should be two such blanks. 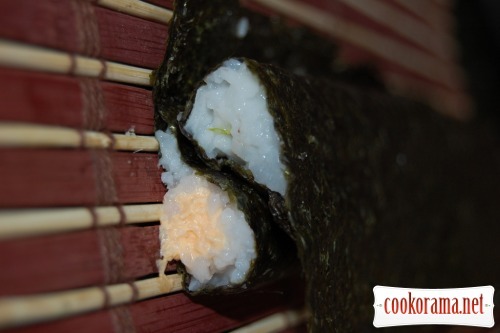 With the help of a bamboo mat make created by «drops» bend closer to the junction of two ends of the nori. Out of «drops» form shape of «comma». Make two blank so that the «comma» came in second bend of «comma». 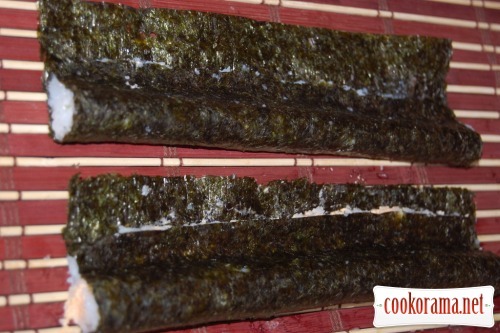 The free ends of the nori (tails that were left free) slightly moisten with water, and using the mat form the final roll. 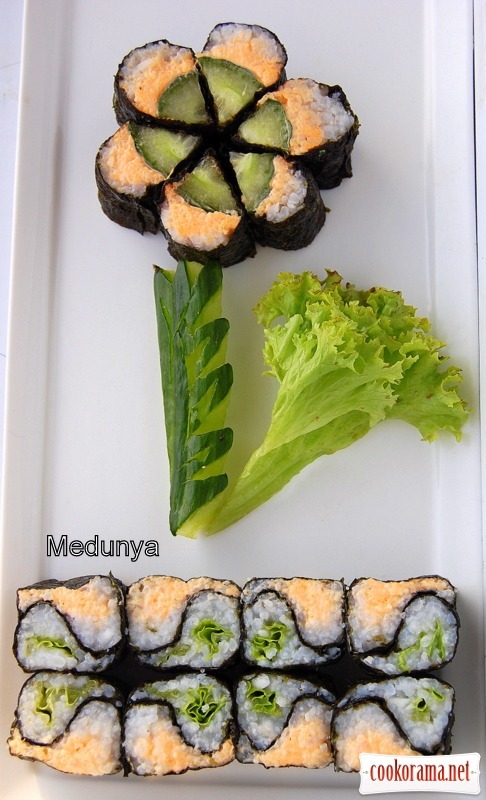 Cut roll in 8 parts with sharp wetted knife. You can take any stuffing for these rolls, just consider that they are contrasting. Top of recipe "Rolls "Yin and Yan""
Recipes, Sushi, Rolls "Yin and Yan"